“The Christmas Tree,” by F.A. Chapman, mid-19th century. 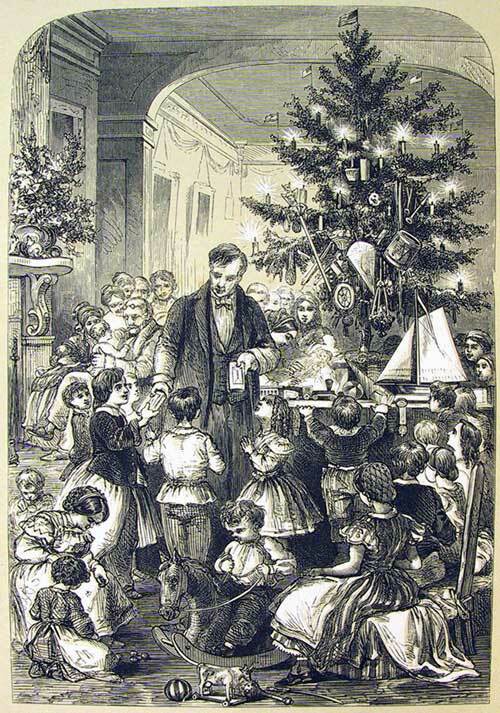 The Christmas traditions of Santa Claus, decorated evergreen trees, stockings, and large Christmas feasts had taken hold. And, to the delight and profit of the City’s merchants, the custom of gift-giving as a Christmas gesture was embraced with enthusiasm. 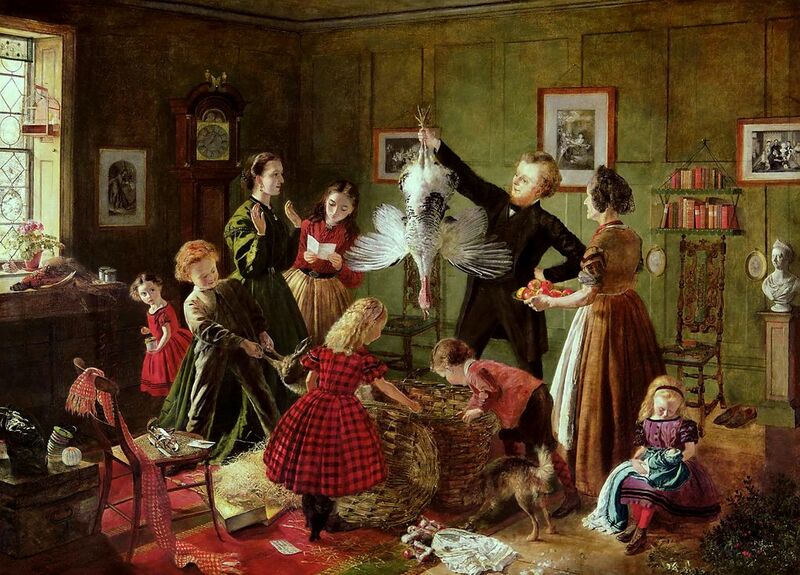 Although we have no record of how the Tredwell family spent Christmas Day in 1850, let us step across the threshold of their home on Fourth Street in our imaginations, and see how they may have enjoyed the holiday. In 1850, there were 13 family members living on Fourth Street: Seabury and Eliza Tredwell, their eight children, two sons-in-law, and one granddaughter. 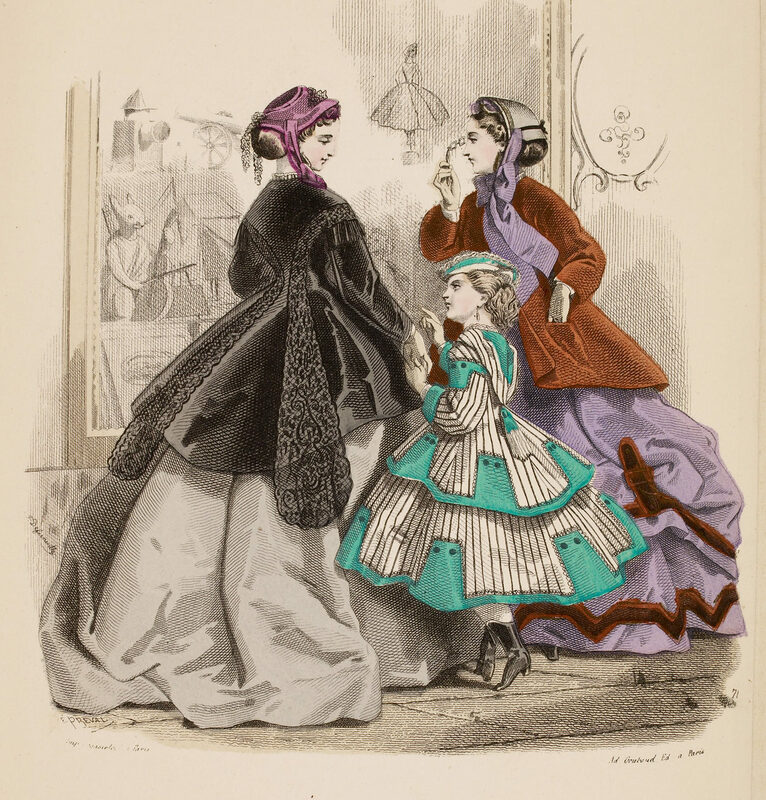 Window Shopping, “The Englishwoman’s Domestic Magazine,” 1866. The museum’s collection includes one gift we can definitively say was given at Christmas, 1850. 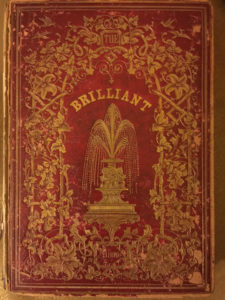 Seabury and Eliza’s fifth child, Phebe, received The Brilliant: A Gift Book for 1850, from her oldest sister Elizabeth. The book, edited by T.S. 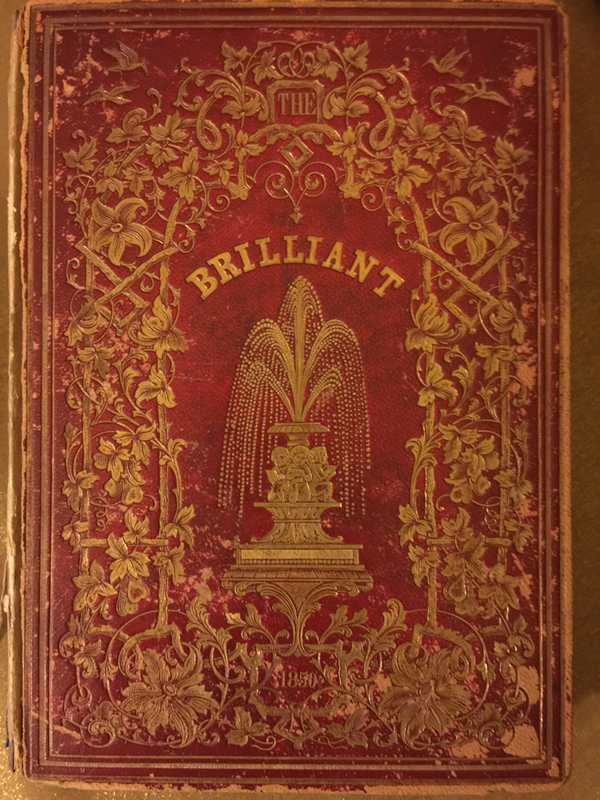 Arthur with 15 lovely engravings and a richly embossed cover, is inscribed “P.E. Tredwell from her sister E. Decr 25, 1850.” Perhaps Elizabeth purchased this from J. Slater’s Book Store, 204 Chatham Square, near the Bowery. Seabury: Cravat, scarf, gloves, morning robe: J. Agate, 237 Broadway, corner Park-Place. 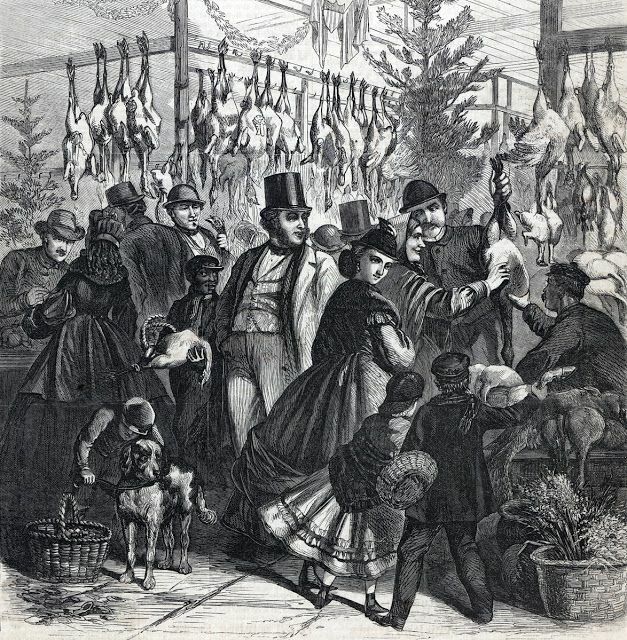 “Buying the Christmas Turkey,” Frank Leslie’s Illustrated Newspaper, December, 1865. 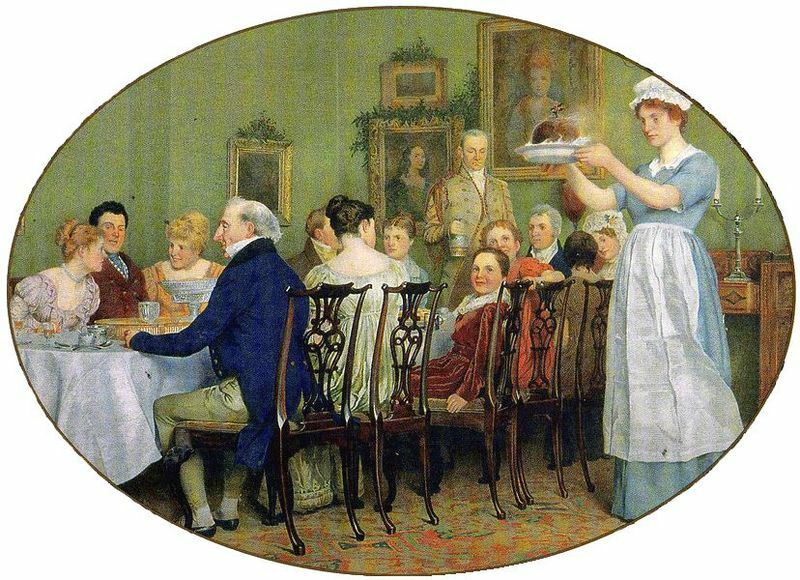 If you are inspired by the baking skills of Mrs. Tredwell and her cook, and are eager to attempt popular 1850 Christmas desserts, here is a recipe from Miss Leslie’s Seventy Five Receipts for Pastry, Cakes, and Sweetmeats (the author’s first cookbook and still popular 22 years after its publication in 1828). 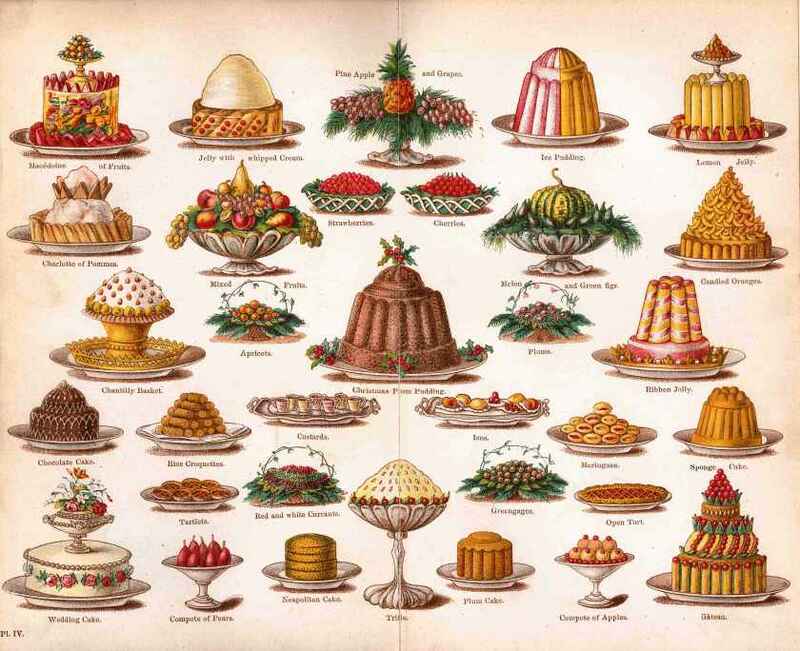 Christmas Desserts, from “Mrs. Beeton’s Cookery Book,” 1861. One pound of raisins, stoned and cut in half. One pound of currants, picked, washed, and dried. One pound of beef suet, chopped fine. One pound of grated stale bread, or a pound of flour. A quarter of a pound of sugar. A table-spoonful of mixed cinnamon and mace. You must prepare all your ingredients the day before (except beating the eggs) that in the morning you may have nothing to do but to mix them, as the pudding will require six hours to boil. Beat the eggs very light, then put to them half the milk and beat both together. Stir in gradually the flour or grated bread. Next add the sugar by degrees. Then the suet and fruit alternately. The fruit must be well sprinkled with flour, lest it sink to the bottom. Stir very hard. Then add the spice and liquor, and lastly the remainder of the milk. Stir the whole mixture very well together. If it is not thick enough, add a little more grated bread or flour. If there is too much bread or flour, the pudding will be hard and heavy. Dip your pudding-cloth in boiling water, shake it out and sprinkle it slightly with flour. Lay it in a pan, and pour the mixture into the cloth. Tie it up carefully, allowing room for the pudding to swell. Boil it six hours, and turn it carefully out of the cloth. Before you send it to table, have ready some blanched sweet almonds cut into slips, or some slips of citron, or both. Stick them all over the outside of the pudding. Eat with wine or with a sauce made of drawn butter, wine and nutmeg. The pudding will be improved if you add to the other ingredients, the grated rind of a large lemon or orange. 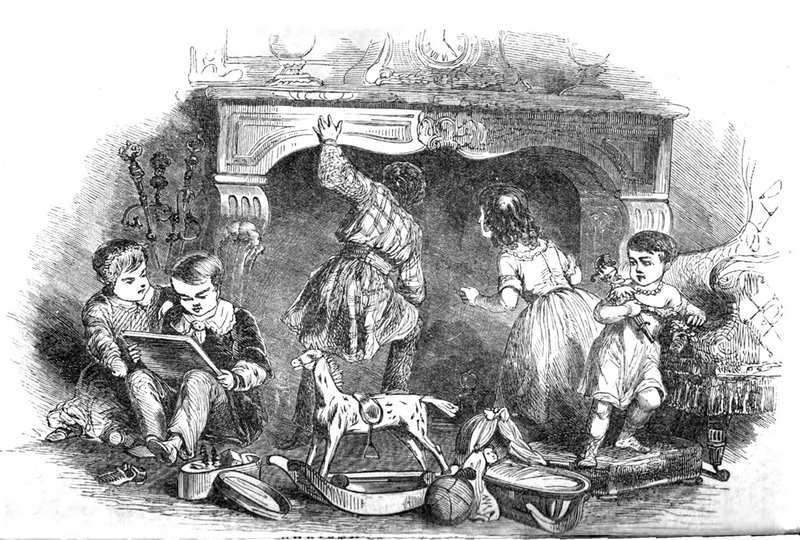 Illustration from “David Copperfield,” by Fred Barnard, 1872. “Then deck your gay homes with the evergreen holly! And light ye the tapers to scare melancholy! “Christmas Morning,” Godey’s Lady’s Book, December, 1850. A Lady of Philadelphia [Eliza Leslie]. Seventy Five Receipts for Pastry, Cakes, and Sweetmeats. Boston: Munroe and Francis, 1828. www.archive.org. Accessed 11/27/18. 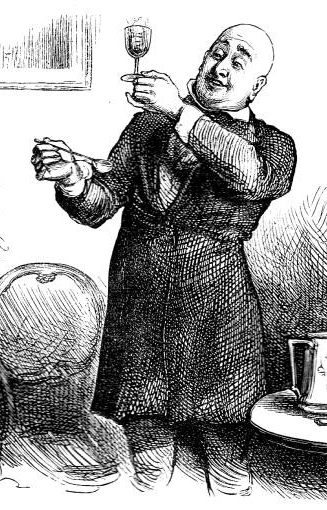 CrateBlog, December 25, 2015. http://www.crateandbarrel.com/blog/charles-dickens-punch-recipe/. Accessed 12/2/18. [Eliza Leslie]. The House Book: or A Manual of Domestic Economy for Town and Country. 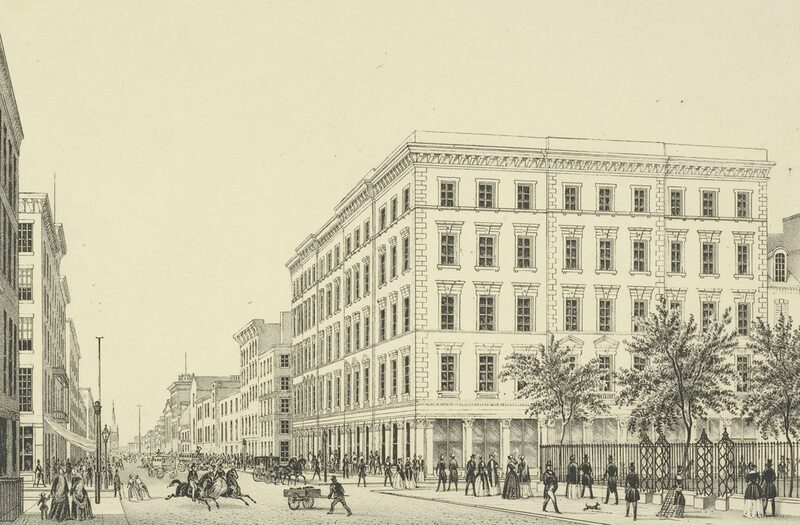 Philadelphia:Carey & Hart, 1844. wwwbabel.hathitrust.org. Accessed 11/28/18. The Evening Post, 22 December, 1849, p. 1. www.newspapers.com. Accessed 11/29/18. The Evening Post, 11 December, 1850, p. 3. wwwnewspapers.com. Accessed 11/19/18. The Evening Post, 16 December, 1850, p. 2. www.newspapers.com. Accessed 11/19/18. The Evening Post, 23 December, 1850, p. 2 www.newspapers.com. Accessed 11/30/18. The Evening Post, 24 December, 1850, p. 2. www.newspapers.com. Accessed 11/19/18. Leslie, Eliza. Directions for Cookery in its Various Branches. Philadelphia: E. L. Carey & A. Hart, 1837. www.gutenberg.org. Accessed 11/28/18. New York Daily Herald, 21 December, 1850, p. 4. www.newspapers.com. Accessed 11/23/18. New York Daily Herald, 24 December, 1850, p. 2. www.newspapers.com. Accessed 11/19/18. New York Daily Herald, 26 December, 1850, p. 2 and 3. www.newspapers.com. Accessed 11/19/18. New York Tribune, 12 December, 1850, p. 5. www.newspapers.com. Accessed 11/23/18. New York Tribune, 23 December, 1850, p. 4. www.newspapers.com. Accessed 11/30/18. New-York Tribune, 24 December, 1850, p. 2. www.newspapers.com. Accessed 11/19/18. New-York Tribune, 26 December, 1850, p.4 and 5. www.newspapers.com. Accessed 11/19/18. Annie, You have outdone yourself with scrupulous research as abundant as the dinner menu.Even the weather report! Face it, you are really a novelist. Thank you very much for a delicious read. Thank you, Liz. All the details are right there in the newspapers and cookbooks of the day. Had so much fun reading them! Happy Holidays to you, too! I LOVE this. Lets us “step across the threshold of their home on Fourth Street,” with our imaginations, but imagination backed up with plentiful research, so we know it’s as accurate as it can be! You’ve done the work we all need to understand the Tredwells and their house at this time of year. And the illustrations you have uncovered! Priceless. And finally I do love that poem that concludes the post. “Joy is wisdom but grieving’s a folly,” Thank you, Annie for this Christmas gift. Thank you, Mary. Merry Christmas!!! Another unbelievable blog post! I’m so impressed with the level of detail in this!!! It’s like going back in time! Thanks so much, Jackie! I am happily becoming very familiar with the newspapers of the period.